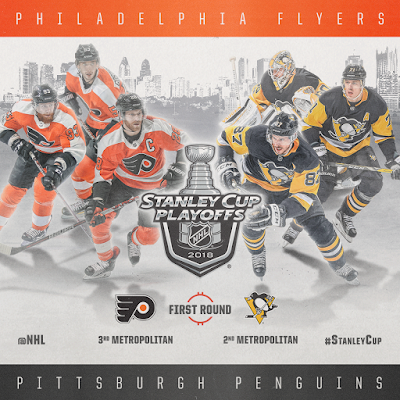 The 2018 Stanley Cup Playoffs begin tonight at 7:00PM on NBCSN. The Pittsburgh Penguins coming off of back-to-back Stanley Cup wins are looking to write even more history. The Philadelphia Flyers are entering the series after drafting at number two overall in the 2017 NHL Entry Draft. These cross-state rivals are very familiar, and, aside from the Washington Capitals, know each other better than maybe any other team in the NHL. They have history (see: everyone dissecting a highly irrelevant series in 2012). They hate each other. Say what you will, but there is no better playoff match-up in the NHL. The ratings that Nielsen will report after the series should speak to that. Whether the series goes four games or seven games, rest assured that everyone in the state of Pennsylvania will be tuning in. SEASON SERIES: The Pittsburgh Penguins and Philadelphia Flyers met four times this season. The Penguins swept the Flyers by winning all games. The Flyers took it to overtime twice, but never prevailed. The Penguins scored five goals each time, which shouldn't surprise you since the Flyers haven't figured out their horrendous goaltending situation all season. ADVANTAGE: If anything can be gleamed out of the season series is that the Penguins have no problem putting up five goals on the Flyers. The Penguins put the Flyers in the precarious situation of outscoring them, which hasn't ended well for our cross-state rivals yet this season. FORWARDS: The Pittsburgh Penguins have one of the most dominant sets of forwards in the salary cap era. Part of this can be attributed to Ray Shero signing Sidney Crosby and Evgeni Malkin to deals which were lucrative at the time of signing, but have become bargains as the cap increases, and, partly due to the wheeling and dealing of Jim Rutherford. The Penguins have supplemented their weakness at center, and are bloated at the wing position. The Flyers are strong themselves with Claude Giroux and Jakub Voracek, and noted rookie Nolan Patrick. The Penguins are a juggernaut offensively, and when it comes down to it, will outmatch almost any team offensively aside from maybe the Tampa Bay Lightning...and that's not even for certain. ADVANTAGE: The Flyers have an MVP candidate in Claude Giroux, but let's be totally serious, Sidney Crosby and Evgeni Malkin are the straws that will stir the drink in this series. The Penguins outmatch the Flyers offensively, and the only way the Flyers can dominate the forward position would be a mistimed slump by the Penguins top centers and Phil Kessel to coincide with a Giroux/Voracek offensive explosion. DEFENSE: Both teams use their defense in a similar fashion, employ fast, skilled and opportunistic defensemen. The Penguins have struggled defensively, yielding many odd-man breaks. In many ways, the Penguins defense has reminded me of the Steelers defense. Opportunistic, yet flawed. The Flyers have Shayne Gostisbehere (aka Ghost Bear) and Ian Provorov, who are the Letang and Schultz of the Philadelphia defense. They can move the puck and are fast, but not awfully big. 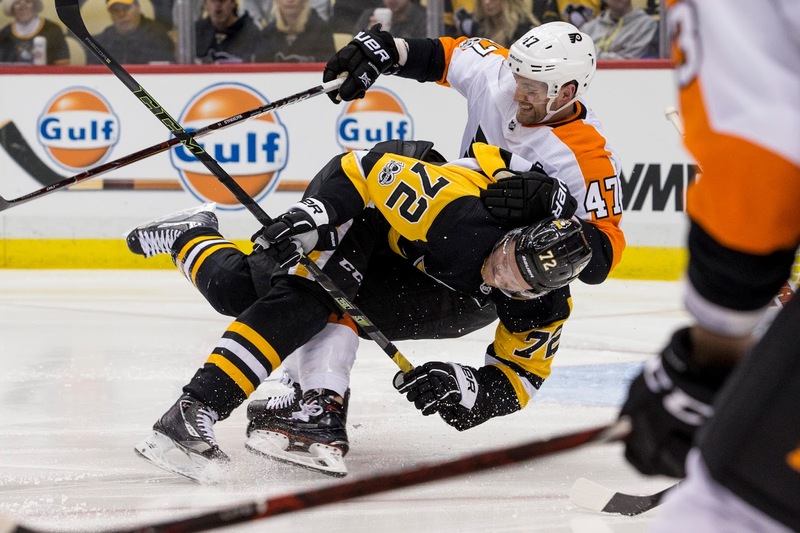 This Philadelphia defense will have a hard time moving guys like Evgeni Malkin off of the puck, which may explain why the Pens put up 20 goals in four games. ADVANTAGE: Both teams are vulnerable on defense, but the Penguins probably are less so. Both defenses are structured to produce offensively, and the Philadelphia defense may be a little better at setting up offensive opportunities and getting pucks to the net. For that reason, I would say the defensive advantage is a draw, but leaning towards the Penguins. GOALTENDING: The Pittsburgh Penguins had goalie controversies, if you want to call it that, over the last two seasons. But really, it was just fans arguing which franchise goaltender they liked better. That controversy is over, and now the Penguins have one franchise goaltender and two capable backups. Matt Murray has struggled this season but was due for a sophomore slump and luckily hasn't struggled as much as Braden Holtby has. Murray is ready for the playoffs, and who else would you want in net starting? The Flyers, well, they've had a rough ride in the goaltending situation since their General Manager played honestly. Brian Elliott is a respectable journeyman who doesn't have much left in the tank. Petr Mrazek has flashes of brilliance mixed in with weeks of very average play. ADVANTAGE: The Flyers will need a miracle to outperform the Penguins in the crease. It could happen, because the Penguins are literally famous for making bad goalies look good, but, it's not likely, and not something I would bet on. PREDICTION: Pittsburgh Penguins in 5. I was leaning towards a sweep, but I do think the Flyers will pull a win out. They are similar teams overall, but in the end the Penguins outmatch them in every logical way. Logic may have no place in the NHL playoffs, but luck has a hard time playing out over a seven game series too.